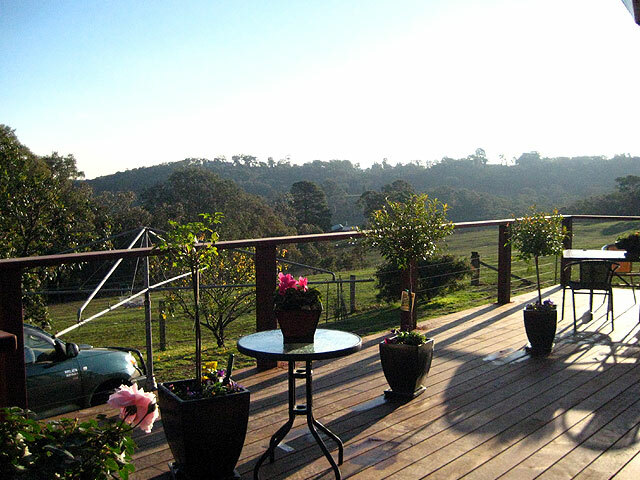 Built on merbau and red gum 150x150mm posts concreted into the ground, the decking is merbau 140x19mm boards on 140x45mm hardwood joists and bearers. We hand-nailed all the boards with twist shank 65mm nails to stop any nail heads working free over time. The stairs and hand rail are select-grade merbau and the stainless steal wiring finishes off the project nicely. A storage shelf has been made under the deck with two opening doors utilising as much space as possible. Halving joins were used on all joist and mitered halving joins on all handrail corners for extra strength and durability. The end result is a fantastic deck made for entertaining.